Converts your forklift into a low-cost mobile boom lift in seconds. Structural steel boom features ten alternate hook positions with clevis-type safety hooks. Telescoping boom retracts to 7'4" and extends to 12' (center line of hook). Also includes: welded hand pull, fork pockets, boom lock and 3' restraining chain. 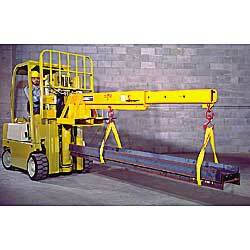 Easy-on easy-off restraining chain with grab hook attaches to forklift carriage to secure the unit onto the forks. Handles 4,000-, 6,000-, and 8,000-lb. loads. Before using, check with the manufacturer of your fork lift for load capacities. Non-telescoping models also available. Additional pocket size options available. SELECTED MODELS IN STOCK. Others FOB MINNESOTA. XC-1403 335	 Standard	 4,000	 7-1/2" x 2-1/2"	 21"	 10"
XC-1404 400	 Raised	 4,000	 7-1/2" x 2-1/2"	 21"	 20-3/4"
XC-1405 422	 Wide Raised	 4,000	 7-1/2" x 2-1/2"	 32"	 16-1/2"
XC-1406 513	 Standard	 6,000	 7-1/2" x 3-1/2"	 21"	 10"
XC-1407 485	 Raised	 6,000	 7-1/2" x 3-1/2"	 21"	 20-3/4"
XC-1408 505	 Wide Raised	 6,000	 7-1/2" x 3-1/2"	 34"	 18-1/2"
XC-1409 406	 Standard	 8,000	 7-1/2" x 3-1/2"	 21"	 10"
XC-1410 527	 Raised	 8,000	 7-1/2" x 3-1/2"	 21"	 20-3/4"
XC-1411 565	 Wide Raised	 8,000	 7-1/2" x 3-1/2"	 34"	 18-1/2"
Note: Special base widths and pocket sizes are numerous. Let us know your special needs. All models available in non-telescoping design.